66. מתניתין עלאין רמאין טבין דימינא. תשע נקודין דאורייתא, נפקין ומתפלגין באתוון, ואתוון בהו נטלין מטלנוי דקיקין ברזי. פלטין, אלין תשע, שליטין אינון אתוון אתוון, מנייהו אתפשטו, אשתארו נקודין לאענאה לון. לא נטלין, בר כד אינון נפקין. 67. אלין אינון ברזא דאין סוף, כלהו אתוון מטללן ברזא דאין סוף. כמה דאינון נטלין לון, הכי נמי נטלי אלין סתימין אתוון, גליין ולא גליין, הני טמירין, על מה דשריין אתוון. 68. תשע שמהן, גליפן בעשר, ואינון: קדמאה אהיה. יו”ד ה”א. אהי”ה אשר אהיה. הויה. אל. אלקים. הוי”ה. צבאות. אדון. שדי. 69. אלין אינון עשר שמהן גליפן בסטריהון. וכל הני שמהן, אתגליפו, ועאלין בחד ארון הברית, ומאן איהו, שמא דאתקרי אדני. ודא אתגלי השתא לאברהם. The Zohar explains that there are nine dots of the Torah that spread among the letters and give them movements. The letters don’t move until Binah release the dots from the letters. The upper dot is called Cholam וֹ, חולם. The middle dot is Shuruk,שורוק, the lower dot is called Chirik חיריק.. Each of them includes three dots for right, left and central column to deliver the light in balance into the vessels. All together comes to nine dots. The Hebrew letters are considered empty vessels until they receive the light/force, originated from the Endless, that moves them. The dots and lines are the force that moves the letters and it is called “Nikud ניקוד”, means ‘dotting’ or “Tenuot תנועות” that means ‘movement’. They represent the Light that comes from Chokmah and Binah into the vessels. Every Hebrew letter represents a channel of energy from the upper levels and, like the periodic table of elements, the Hebrew letters can be organized in different groups. The ‘Nikud’, which is the Hebrew vowels, are like electrons that envelope the nucleus (a Hebrew letter) and bond with other letters to make molecules (words and sounds) of endless forms and possibilities.While the periodic table has specific rules related to bonding with different elements, there’s no limit to the number of possibilities that the Hebrew letters can form into different spiritual energies. With the Hebrew letters we can use the force of the Endless in this world but without proper knowledge we can not ‘play’ with the letters. 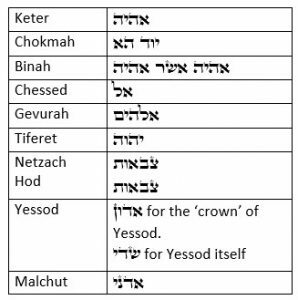 Nine names of God came out as ten because the sefira of Yessod has two names אדון and שדי that serve like a door to the upper levels. This are the names revealed to Abraham. Only after he had his circumcision he could connect to the name אדני ADNY and open all the upper levels. Without a circumcision the soul is blocked from connecting to the Light.